The timing lights device box was lightweight and seemed empty. When I got home I opened it to see how the inside looked like and where to replace the batteries. Yes, the LED lights are all battery-operated. The box is easily collapsible. All detachable parts of the box are actually held together by just a couple of screws at the bottom of the box. You only need a Phillips-type screwdriver to disassemble. Shown below is the opened box and its contents. Notice the colored insulated wires that match the colors of the LED lights. That certainly makes assembly and troubleshooting much easier. 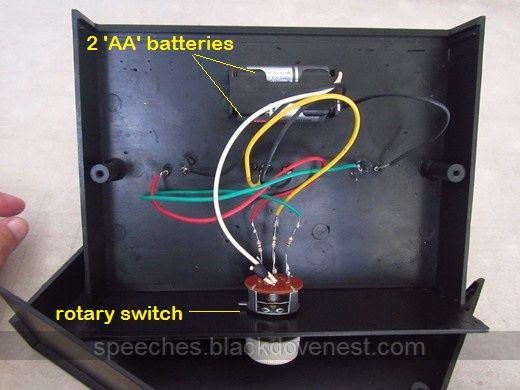 Only the white (1 pc) and black (3 pcs) colored wires attach to the terminals of the two "AA" batteries. The green, yellow and red wires attach to one terminals of the rotary switch and another to the LED light. Because of the circuit, the rotary switch lights up only one bulb at a time. When turning the knob clockwise, the sequence is always off, green, yellow and red - unless the user turns the knob counterclockwise and the sequence is reversed. Assembling back the box together was a bit more challenging because there are slots that the box's sides need to slide into before it would actually look like a box. Only when the sides are fitted together could you then return the two screws correctly into place. When the timing lights device was delivered, the black box didn't have any markings. There was no label of any kind. I suppose you could operate the device based solely on intuition after turning the knob a few times. The first thing I thought was that this contraption would be used by anybody who would be assigned as timer. And whoever that is would probably need some instructions on how to operate it - if only to save time in familiarizing with the timing lights device. Well, what better way to do that than to post these instruction labels on the black box itself. So with a sticker labeler, I printed out several sticker labels. Essentially, the circuit is such that it is either "off" or "on". "On" could just mean green, yellow or red. Other than that, the device may be broken. But just to let the Toastmasters meeting timer know, I put labels around the rotary switch knob to indicate the possible states of the circuit. I also put arrows on the knob itself to point to the correct state. The gold-colored number markings on the knob have no purpose for this device. You probably notice that one of the arrows does not exactly point to the "OFF" position and is offset to the left. The spindle to which the white knob is attached has a bit of slack. But the knob clicks correctly into all the positions.